Nanoparticles (NPs) are atomic clusters of crystalline or amorphous structure that possess unique physical and chemical properties associated with a size range of between 1 and 100 nm. The nano-sized dimensions of NPs are similar to the size of many vital biomolecules such as antibodies, membrane receptors, nucleic acids, and proteins. These mimicking size features, together with their high surface area to volume ratio, make nanoparticles a powerful tool in modern nanomedicine. The increasing demand of clinical applications and the development of nanobiotechnology have substantially promoted bioengineering strategies for a variety of nanosystems in different areas of applications such as molecular imaging, point-of-care diagnostics, and targeted therapies [1–8]. It seems reasonable to note that the extraordinary properties of nanoparticles have led to an exponential increase in the reactivity at both cellular and molecular levels. To meet these challenges, the design of multi-functional nanoparticles could significantly improve already existing knowledge. Monofunctional nanoparticles have a single feature. For example, in cells and tissues, a nanoliposome can transport drugs but does not have the ability to distinguish between healthy and unhealthy cells or tissues . In contrast, multifunctional nanoparticles combine different functionalities in a single property-designed nanocomposite. For example, a nanoparticle could be functionalized with an appropriate moiety possessing a specific targeting function that recognizes the unique surface signature of its target cells [10, 11]. Simultaneously, the same nanoparticle can be modified with an imaging agent to monitor the transport process and evaluate some pathological features. Last but not the least, the nanoparticle can be linked to a moiety to evaluate the therapeutic efficacy of a drug and to reduce its side effects. Such multifunctional nanoparticles will be defined here as theranostics (combination of therapeutics and diagnostics). As these NPs come into contact with cells and body fluids, they are exposed to many self-assembled changes in terms of ionic strength, pH, protein concentrations, and compositions, all of which affect the properties of NPs and their interactions with the cells [7, 12]. The unique behavior of NPs in terms of cellular endocytosis, transcytosis, neuronal and circulatory translocation and distribution that make them desirable for medical therapeutic or diagnostic applications, may also be associated with potential toxicity [13, 14]. Efforts have been made to optimize the methodology applied in the area of nanotoxicology, especially theoretical modeling, to keep up with the pace with which novel NPs are being developed due to safety by design approaches [15, 16]. Rapid technological progress has led to the use of a number of advanced nanomaterials for constructing smart multifunctional nanosystems for targeted diagnosis and therapies of various diseases including cancers [6, 16–18]. In personalized therapies, the treatment approach should ideally and exclusively target the anomalous cancerous cells and tissue with no or minimal impact on the normal cells. The present review provides an overview of the most recent (mostly last 3 years) scientific achievements related to different biomolecules used to enable targeting capabilities of highly diverse nanoparticles. These include monoclonal antibodies, receptor-specific peptides or proteins, deoxyribonucleic acids, ribonucleic acids, aptamers, and small molecules as folates and even vitamins or carbohydrates. Multiple anticancer agents designed as a single nanocarrier can optimize their pharmacokinetic profiles and biodistribution behaviors in a spatiotemporal co-delivery mode, resulting in a more efficient synergistic antitumor activity, compared with the conventional drug mixtures . Jiang et al. developed a novel polyethylene glycol (PEG)-functionalized GO nanostructure as a new cellular protease-mediated co-delivery system that integrate membrane-related proteins and intracellular-functioning small-molecule drugs. Such GO nanocarrier was enabled to efficiently release its cargo, namely tumor necrosis factor (TNF)-related apoptosis-inducing ligand and doxorubicin (DOX), in a site-specific manner. Taking advantage of furin presence on the cell membrane, the furin-cleavable peptide was inserted between PEG and tumor necrosis factor-related apoptosis-inducing ligand to start the release of TNF-related apoptosis-inducing ligand in the tumor environment. The GO nanocarrier with the possibility of co-delivery of furin-cleavable TRAIL and doxorubicin application was shown to inhibit tumor growth in A549-xenografted mice more effectively than co-delivery of furin-noncleavable tumor necrosis factor-related apoptosis-inducing ligand and doxorubicin on GO, and delivery of tumor necrosis factor-related apoptosis-inducing ligand and doxorubicin using GO alone . More recently, Yemisci et al. showed that a large peptide such as basic fibroblast growth factor and a small peptide inhibitor of caspase-3 (z-DEVD-FMK) can be effectively transported to the brain after systemic administration by incorporating these peptides to brain-targeted nanoparticles. NPs were prepared by loading either peptide to chitosan–polyethylene glycol-biotin graft polymers followed by conjugating with antibodies directed against the transferrin receptor-1 on brain endothelia to induce receptor-mediated transcytosis across the blood–brain barrier (BBB). Neuroprotection was not observed when receptor-mediated transcytosis was inhibited with imatinib or when basic fibroblast growth factor-loaded NPs were not conjugated with the targeting antibody, which enables them to cross the BBB. Nanoparticles targeted to the brain are promising drug carriers to transport large and small BBB-impermeable therapeutics for neuroprotection against stroke and different glioma cancers [3, 27–30]. It has been reported that folate receptors (FR) are overexpressed on the surface of numerous cancer cells, including breast, ovary, lung, kidney, head and neck, brain, and myeloid cancers . The overexpression of these receptors in tumor cells and their low and restricted distribution in normal tissues, along with the ability to observe tumor-promoting functions, together render FR an attractive therapeutic target. Considering this benefit, it is not surprising that folic acid has been used as a targeting ligand in various nanocarriers. 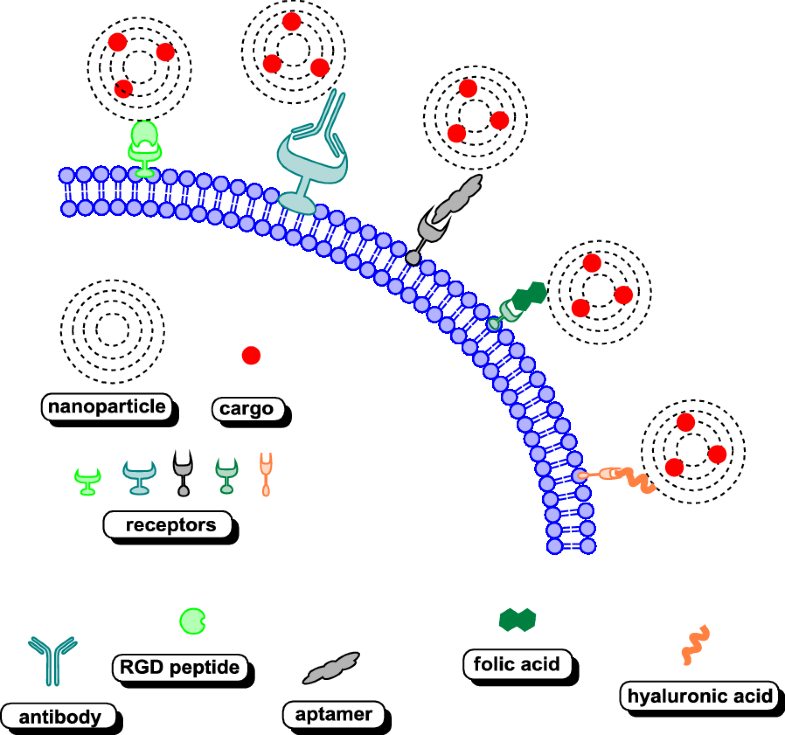 There are numerous FA-targeted nanosystems constructed using GO, rGO, β-CD, magnetic NPs, and DNA and functionalized with different agents for use as drug nanocarriers and chemo-photothermal therapy facilitators and in radiotherapy and gene delivery [6, 10, 12, 14, 75–80]. Owing to the synergistic contribution of co-functionalized units, the constructed nanosystems can be used as a targeted delivery system to efficiently carry the drug molecules to specific sites with low toxicity to normal cells. An appropriate nanoparticle structure with the use of linkers susceptible to various factors, most important of which is tumor environment pH, improves drug release and allows to control their discharge [62, 67, 81, 82]. In vitro tests with folate receptor-targeted hybrid nanovehicles in a cancer cell line demonstrated exceptional cytotoxicity, high cellular uptake, and ability to induce apoptosis. A noteworthy finding is the increase in bioavailability and plasma circulation time of the carried drugs that was observed in an in vivo pharmacokinetic study. It was also demonstrated that cargo substances could be protected by the “shell” of functionalized nanomaterials during blood circulation [10, 83]. PEGylated folate was also used to deliver siRNA and miRNA, as described in the section “Gene delivery” [84–86]. 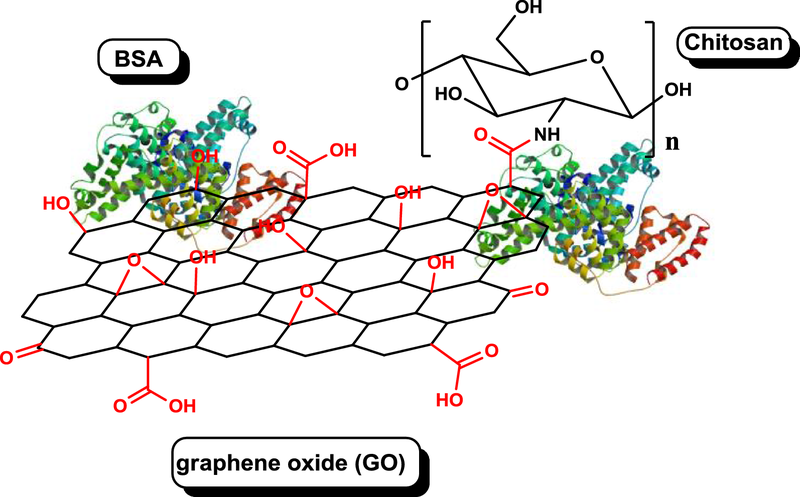 Recent examples of FA-targeted nanomaterials are summarized in Table 1, and schematic visualization of GO- or reduced graphene oxide-based folic acid receptor-targeted nanosystems are presented in Fig. 4. Multidrug resistance (MDR) is an important issue that affects the successful chemotherapy using some anticancer drugs. MDR can exist intrinsically, but generally gradually develops during the chemotherapeutic treatment of initially sensitive cancer cells. Multiple mechanisms contribute to MDR, including inhibition of drug-induced apoptosis, activation of DNA damage repair mechanisms, and increased expression of the efflux pumps [109–111]. These efflux pumps recognize a broad range of drug molecules and rapidly and efficiently transport low molecular weight chemotherapeutic agents out of cancer cells. Currently, one of the strategies to overcome MDR is to use nanotechnology-based drug delivery systems. Because of their size, nanodrugs are internalized through endocytosis instead of passive diffusion across the cell membrane, thereby bypassing the drug efflux pumps responsible for MDR. The nanogels based on hydroxyethyl methacrylamide-oligoglycolates derivatives covalently loaded with doxorubicin and subsequently decorated with a folic acid-PEG conjugate constructed by Chen et al. could overcome multidrug resistance. Moreover, the acid-labile hydrazone bond between DOX and the methacrylamide polymeric network enabled pH-responsive drug release. The folate receptor-positive B16F10 melanoma cells showed specific uptake of the targeted nanogels. This demonstrated efficient internalization of nanogel, lysosomal trafficking, drug release, and nuclear localization of DOX. The folic acid-targeted nanogels allowed to avoid drug efflux pumps in DOX-resistant 4T1 breast cancer cells through upregulation of the folate receptor. This resulted in highly efficient killing of resistant cancer cells . Ligustrazine also improves the sensitivity of multidrug-resistant cancer cells to chemotherapeutic agents. Cheng et al. synthetized folate-chitosan nanoparticles by combination of folate ester with the amine group on chitosan to use them as a delivery vehicle for ligustrazine. The obtained results showed adequate encapsulation efficiency, loading capacity, and release rate of ligustrazine. The cumulative release rate was approximately 95% at pH 5.0, which was higher than that at pH 7.4. Drug-carrying NPs were internalized into MCF-7 cells through FR . Both biodegradable polymeric folic acid functionalized nanogels and ligustrazine chitosan folate receptor-positive tumor cell targeting drug delivery system have potential for treating multidrug resistant malignancies during cancer therapy. DNA aptamers are short single strands of DNA or RNA oligonucleotides that can readily self-hybridized with itself to show important tertiary structures. They can bind to cell surface receptors and enter cell targets with high specificity . Aptamers, generated by the systematic evolution of ligands by exponential enrichment (SELEX) method, are short, artificial, single-stranded oligonucleotides that, similar to antibodies, interact at high affinity with their targets by recognizing a specific three-dimensional structure. Advantages of using aptamers over antibodies are that they have high specificity, low-molecular-weight, and easy surface immobilization through their functional groups. As they are easily reproducible, they are usually inexpensive and have a higher shelf life than antibodies [132, 133]. A number of aptamers capable of recognizing target receptors have been reported [78, 134–136]. The most commonly described aptamer MUC1 named S2.2 binds with high affinity to abnormally glycosylated mucin-1, a cell surface glycoprotein, which expresses in many cancers, such as breast, colon, lung, and ovarian cancers . Increasingly more than one aptamer is used for targeting. Usually, the dual aptamer-functionalized nanomaterial contains ATP aptamer. Its presence could facilitate deconstruction of nanosystem in lysosome, which has high amounts of ATP. Because of these properties, one can achieve more effective and faster release of chemotherapeutics loaded on/into aptamer-decorated nanocarriers. It was proven that aptamer binds to its corresponding target with a higher binding constant relative to its complementary strand . General principle of utilization of nanovector system usually consists of loaded anticancer drug-targeted delivery with ligands, which can specifically bind to tumor markers that are overexpressed on the surface of cancer cells but with relatively low expression or even no expression on normal cells and tissues. Moreover, few studies have attempted to load therapeutic aptamers on metallic NPs and demonstrate their functional activity in photodynamic therapy in vitro. As shown in Table 2, most studies to date have used carbon-based NPs for aptamer delivery, and only a few studies have used polymeric NPs. Several micellar nanoformulations were evaluated on the basis of targeting efficiency, cellular association, cellular internalization pathway, and cytotoxicity for the reversal of chemotherapeutic agent resistance on miscellaneous multidrug-resistant cell lines [177–179]. 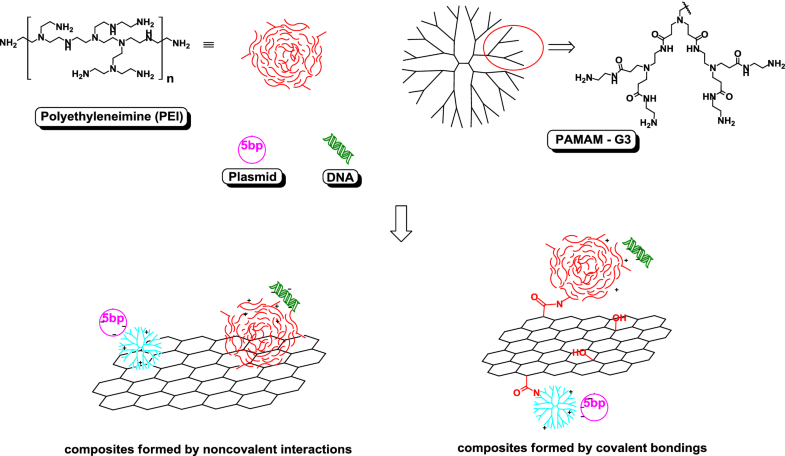 In addition to pDNA, small interfering RNA (siRNA) with therapeutic functions may also be delivered by all types of graphene-nanopolymer complexes into cancer cells for potential gene therapy, which could be further combined with graphene-based chemotherapy and photothermal therapy [249–254]. RNA interference (RNAi) treatment, belonging to the post-transcriptional gene silencing process, is a promising and effective method for gene therapy in cancer treatments. Small interference RNA (siRNA) plays an indispensable role in gene silencing. However, naked siRNA has difficulty in crossing the cell membrane and can easily be deactivated by enzymolysis. Developing a new delivery system to circumvent complex extra- and intracellular barriers for successful translation is the gene-targeting technology that has great potential.